Just south of the Humboldt-Toiyabe National Forest, right next to Carson City and I-580, you find the serene and luminescent body of freshwater known as Lake Tahoe. From its mountains powdered with snow to the premier viewpoints around the lake, Lake Tahoe is an exceptional place for memorable vacations. The organization promoting it, North Lake Tahoe, wanted to inform prospective tourists about the area and its potential for a quality family vacation. However, informing tourists by bringing them in to the Lake Tahoe area was not a feasible or cost-effective option, especially for the customer. So, instead of bringing people to the lake, what better way to inform people about it by bringing Lake Tahoe straight to them? Not physically shipping it truck by truck, but by bringing the vibe and opportunities to potential visitors. 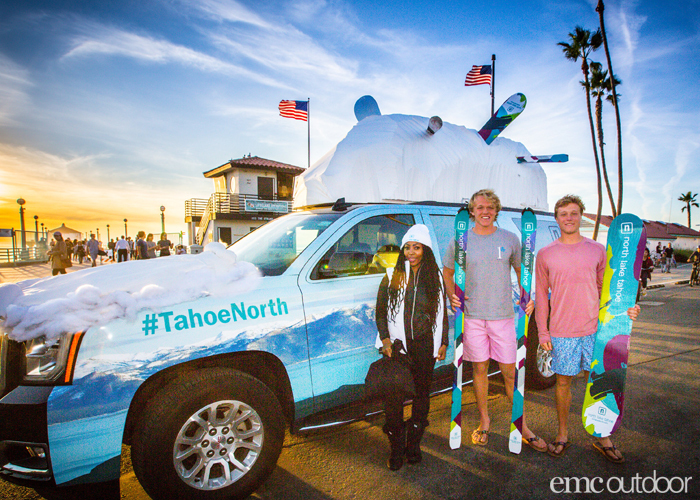 North Lake Tahoe teamed up with EMC Outdoor for an experiential campaign which included a branded North Lake Tahoe truck with a custom fabrication of a snow covered roof, a team of brand ambassadors and a camera crew to bring the Lake Tahoe scene straight to consumers where they least expected it – the dry, hot Los Angeles, CA area; a city that winter rarely ends up visiting. 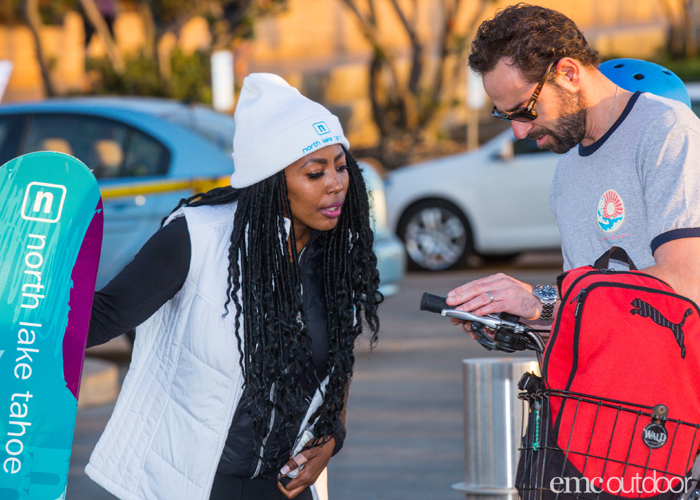 So, in January, with LA locals sporting bathing suits and tee shirts, North Lake Tahoe targeted 27 various locations around the Los Angeles area to spread the word about Lake Tahoe. 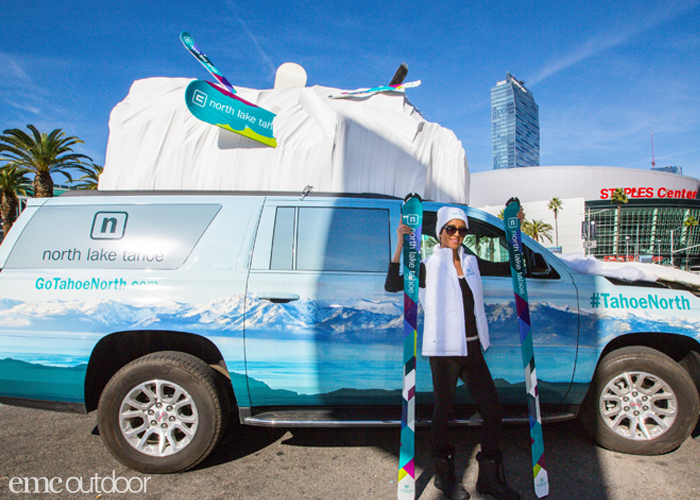 With each stop made, people found their way to the snow-capped SUV’s to snap a picture with the brand ambassadors, discuss the options a vacation at North Lake Tahoe could offer, and take away some branded sunscreen. 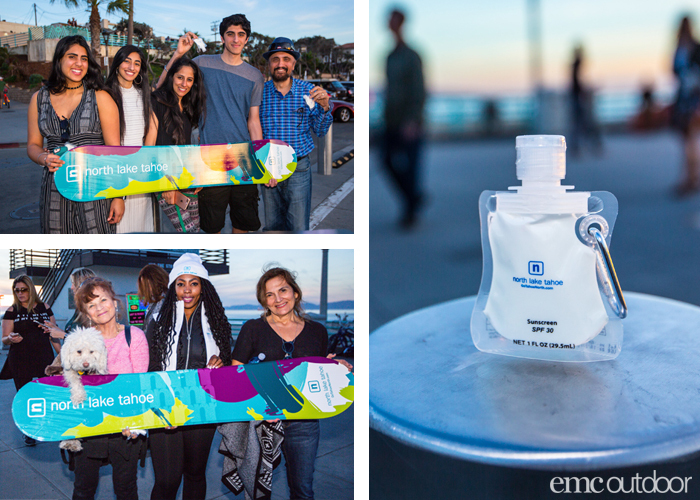 The campaign was also shown on Facebook Live for their followers, which combined with the OOH for over 180,000 total impressions in just a 3-day period with brand ambassadors distributing 3000 bottles of branded North Lake Tahoe sunscreen. Why did North Lake Tahoe decide to advertise a cold vacation spot in the hot, dry Los Angeles area? When people are looking for a vacation, they tend to look for areas that are different from their homes. 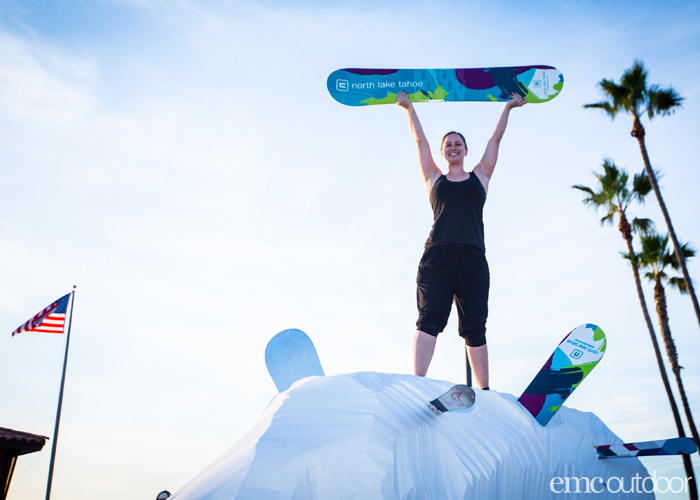 Recognizing this, North Lake Tahoe and EMC Outdoor knew that the placement of this experiential activation – bringing two totally different climates together – made for a major impact. Along with that, a flight to North Lake Tahoe is just over an hour from the LA metro area, a reminder to locals that a snowy wonderland was not far away. 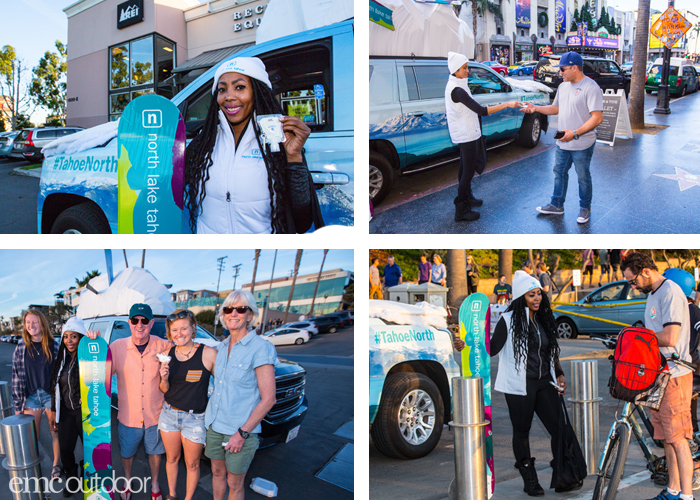 February 6, 2018 | Filed under Daily Updates, Event Marketing, Featured, Guerrilla Marketing, Non-traditional Media, Street Teams, Wrapped Vehicles and tagged with California, experiential, experiential marketing, guerrilla media, Los Angeles, mobile advertising, Street Team, tourism, travel, wrapped vehicle.